April Spring Clean #Crowdcrewbox Reveal! For the month of April, we will be providing 3 winners with a #AprilSpringClean #Crowdcrew Box to help inspire you to get spring cleaning. Our box includes some of our favourite cleaning products to make your life a bit easier. Let us know in the comments below which Cleaning Personality you are for a chance to win 1 of 3 boxes! Follow us and Like our Contest Posts on Instagram & Twitter for an extra chance at winning. Good Luck! View Full Terms & Conditions Here. 1 $50 Walmart Giftcard to spend on whatever Spring Cleaning Items you need! What is your Spring Cleaning Personality? You are the Monica of the house, that means you have a system and you stick with it! You own all the cleaning product you could ever need and have a spot for everything. You find it enjoyable to get the cleaning done in a precise way and on your own, there is nothing wrong with that! You got this and don’t need any help! You’ll get your spring cleaning done… on your own terms! You prefer natural cleaners and clean the rooms you feel need it the most, it is all about balance to you. You trek through spring cleaning when you need to and know when to relax and put your feet up. You can always leave it for another day! You’ll get to it, you just never REALLY want to. 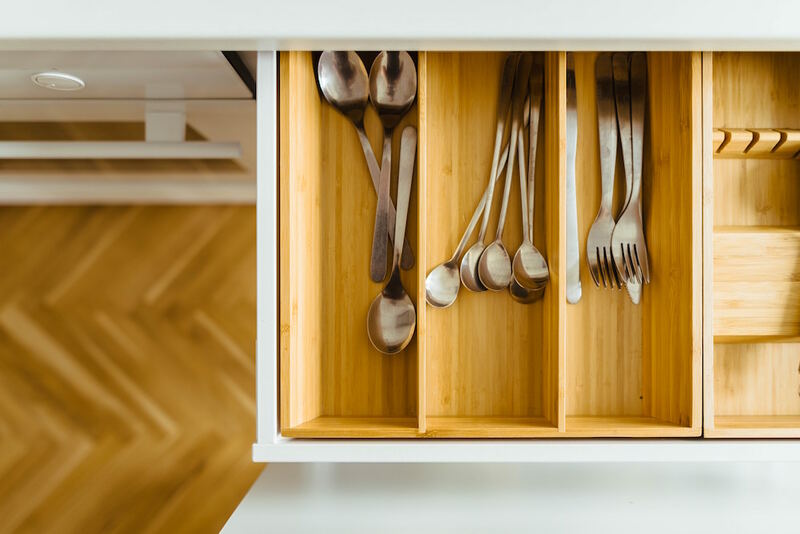 Nevertheless, you rely on technology whether it is a Pinterest Spring Cleaning Checklist or Tips and Cleaning hacks to make your Spring Cleaning go as smoothly and quickly as it can. You vaguely remember that advice your mom gave you years ago and could end up calling or face timing her for help. We get you, don’t worry. As long as it gets done, does it really matter how? Let us know which personality you are in the comments below for a chance to win one of our #AprilSpringClean #Crowdcrew Boxes! I am the professional procrastinator , on so many levels, and in all areas of my life!! Aren’t we all!! Thanks Joy 🙂 Good Luck! My spring clean personality would be The Casual Crusader!! Laid back but you still get things done! You need to teach me a few things 😉 Thank you for your comment & Good Luck Kellie! Lol…. after reading of them I have to admit I’m totally A Monica!!! Yes I’m obsessed and I’m the same way at home as I am at work. I’m sure I drive everyone around me crazy clean lady they say!! I’m ok with that, cleaning makes me happy!! Lol It’s ok we love Monicas! If it makes you happy then there is no harm in it <3 😉 Good Luck Julie! I’m a The Casual Crusader. My spring clean personality would be The Casual Crusader!, I work shift work, so I have to do a bit here and there. Casual crusader…I think. Or possibly….I panic and run screaming through the house cleaning when someone calls and says they’re coming over :). At the end of the day..what needs to get done happens …lol. But I do like to clean. Lol Love it Linda! Keep up the great work <3 and good luck! The Monica! I have a system and I stick to it! No procrastinating for this girl! I am totally the Professional Procrastinator. Growing up i used to pay my sister $50 to do the dishes on my nights…. And we had a dishwasher! I am DEFINITELY the Casual Crusader. It describes me to an absolute tee! The Professional Procrastinator who goes mad cleaning when needed. The Savvy Sourcer for sure. There is nothing wrong with cleaning on your own terms and when you have time! 🙂 Thanks for the comment Grieta! Good Luck. The Monica is definitely me . Thank you for the chance. Who doesn’t love Monica? 😉 Thanks for the comment Sherry & Good Luck! The Monica 100%. I am a mean, lean cleaning machine! You Go Girl! Love the motivation, keep it up. 🙂 Thanks for the comment Carolina & Good Luck! I am a professional procrastinator, sprinkled with a bit of casual crusader.. #AprilSpringClean I wish I was a Monica but it’s not in ne. Looking forward to inspiration to change it around. Off I go to ensure I have already liked the Instagram and Twitter posts. Love the motivation! Thanks for the comment Jeannine 🙂 Good Luck! The Casual Crusader! That is me! I am definitely a Professional Procrastinator. I find spring cleaning to be overwhelming after a long winter of a family of six people and three animals cooped up together. Sounds overwhelming, cleaning can wait 😉 haha, thanks for commenting. Good Luck! I am the Casual Crusader for sure. A great balance. 🙂 Thanks for commenting, good luck! I’m definitely The Casual Crusader. After checking 5 off the 15 list of to do’s, I’ll take a victory sit and get to the other stuff later. The casual crusader. I do spring cleaning when I think a room need to be done. Me too, unfortunately, that is when you can’t see the floor… 😉 haha! Thanks for commenting and good luck! I am a Casual Crusader! Sigh, Don’t we all aspire to be Monica? 😉 Haha Good Luck and thanks for commenting! Haha, train them to be little Monicas! 😉 Thanks for commenting, Good Luck! I am definitely a mix of Monica and a casual crusader. 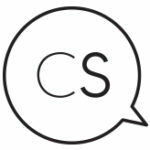 The Casual Crusader – with a new baby it is the only way it is getting done. I am definitely The Monica! We’re all a little guilty! 😉 Good luck & thanks for commenting Sara. I’m a Casual Crusader. I will get it all done, but I don’t like to stress myself out about it too much. I’m the Professional Procrastinator. I would rather sew than clean! I love sewing and totally get it! 🙂 Thanks for the comment & good luck Sandra. I think we all have a little Monica in us 😉 lol thanks for the comment & good luck Chelsea! I am definitely the casual crusader. Bathrooms and kitchens must be done regularly, but the rest is whenever i feel the urge!! I’m the Casual Crusader, I get around to it, on my own terms, I actually organized my wrapping paper this weekend! The Professional.Procrastinator for sure. But if it’s a purge, I’m in! I’m definetly the professional prcrastinator! Rather do anything else, especially when i let it go too long, and it turns into a big job. Somtimes though, I can motivate myself to do a teeny tiny bit of everyday, so that at least the main things get done each week. im a The Professional Procrastinator for sure! I am a casual crusader. This is my spring personality and best represents who I am. I am the Casual Crusader. I am a casual crusader with a touch of professional procrastanator on the side! We all slide sometimes 😉 Thanks for commenting & good luck Jo-anne! slow to get started, once I get going, like to finish! I am The Monica for the most part. Nothing wrong with taking charge and being in control! 🙂 Thanks for commenting & Good Luck Kimberley! I am The Professional Procrastinator! We all are sometimes! 🙂 thanks for commenting & good luck Shirley! Aren’t we all? Lol 😉 Thanks for commenting & good luck Fay! I am definitely The Professional Procrastinator… I hate cleaning and will do whatever I can to avoid it!! I used to be a Monica, but have become a casual Crusade over the years. Sometimes, you just gotta let things go. %100 the professional procrastinator. I will give more details about it tomorrow……. I’m a casual crusader . It will get done , but there are lots of other things in the job jar . I wish I was a professional procrastinator, because professionals get paid! As it is, I’m just a procrastinator. I am for sure the professional procrastinator. My mom always called me “last minute Michelle”. Lol 4 kids and 2 dogs being home all day…..who wants to clean?! I am getting it done….never ending laundry. I am definitely The Savvy Sourcer. 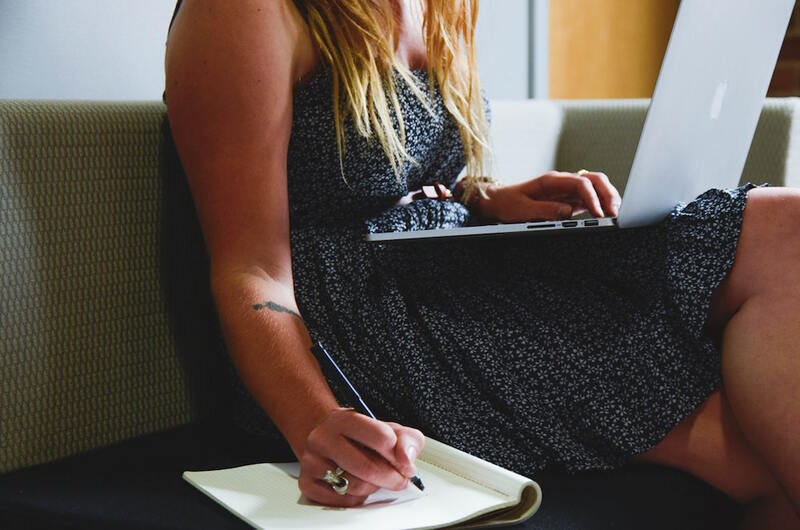 I’m using websites to give me ideas, tips, and timelines to get it all done! I am the Casual Crusader. I like to take my time to clean whenever I can. KEEPING IT CASUAL BUT STILL GETTING MY CLEANING DONE. I LIKE THE FRESH SMELL AFTER YOU HAVE CLEANED THE HOUSE. I am the casual crusader, I clean when I want, and when I need to. Sometimes it’s a huge all day clean sometimes just a little daily. Nothing wrong with that 🙂 Good luck & thanks for commenting Calvin. I’m usually a casual crusader, but I can get into The Monica during spring cleaning. It happens to the best of us 😉 Keep up that motivation! thanks for the comment & good luck Tracy. I have become the Casual Crusader after having been the The Monica for far too many years! Got bored of caring so much? We get you 😉 Good luck & thanks for commenting Fran! I plan to be the Casual Crusader but usually end up being the Professional Procrastinator. I am a Saavy Sourcer / Monica hybrid. I guess it depends on the day! I’m a The Casual Crusader. My biggest spring cleaning job is preparing the perennial beds and the soil in the veggie garden. I am the Casual Crusador! I would have to say I’m the casual crusader. Depends on what mood and I’m in . Can I be two? Definitely the Casual Crusader and on my way to becoming the Professional Procrastinator. These gifts would help me become more like Monica. the casual crusader with a bit of monica’s preciseness! 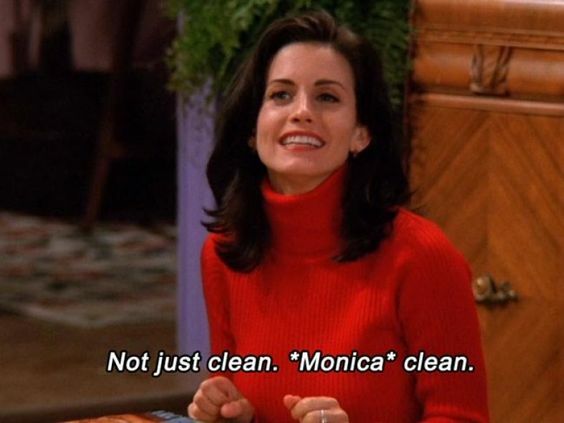 I am Definitely the Monica Clean. I even clean for my two friends whenever I come over, its the first thing that needs to be done. I am definitely a “Casual Crusader”. I am definitely a Casual Crusader. I am for sure The Professional Procrastinator! I tackle the small things and have a list, but something – or anything usually comes up! Casual Crusader/Professional Procrastinator combo. As in, I rarely clean my windows because they really do get just as dirty with the next rainfall. But I do a thorough cleaning on whatever I see as a priority–weekly bathroom and shower cleaning, for example. I’m the professional procrastinator. What spring cleaning? My spring cleaning personality would be the The Casual Crusader. The Savvy Sourcer is definitely my type of Cleaner! I find myself to be The Professional Procrastinator I find that I used to really enjoy cleaning but not so much anymore. Thanks for the chance. The Professional Procrastinator for sure. I’m the Monica. I need it clean and I need it clean right now or I won’t rest! I am mostly The Professional Procrastinator, although some years I sway toward The Casual Crusader. I am the Professional Procrastinator. I used to get it done yearly, but as I get older I think, why bother? I am definitely The Professional Procrastinator. I would rather be outside! I used to be a Monica in my younger days, but have blossomed into a profressional procratinator. I’m the Professional Procrastinator for sure! I’m a strange take on the Monica for sure! I take on spring cleaning to the extreme as a way to procrastinate from doing other things on my to do list. I am the Professional Procrastinator, for sure. I use to be the Monica but I am now the The Casual Crusader! Thank you! I am the Professional Procrastinator, I am not a slob nor a pig but I am a comfortable lived-in look sort of gal. I very much used to be the Monica. Now I’m the mom of 3 active boys and I find it hard to keep up with these tornadoes! I’m definitely the Savvy Sourcer. Try to be as efficient as possible! I am the professional procratinator. I am the The Professional Procrastinator. I get done what my guests can see and hide the rest! I am The Professional Procrastinator, I dread cleaning in the worst way. I’m usually the Casual Crusader but when I get into the mood, I can be a real Monica! I am the The Casual Crusader. I am most like The Monica. I am a Casual Crusader. I am definitely The Casual Crusader although I wish i was more like Monica! Sigh.. No beating what you are I suppose! Just…dont look in that closet. I’m definitely The Casual Crusader! I’m definitely The Casual Crusader. I burst out laughing when reading this,. My friends actually nicknamed me Monica years ago, so I am definitely The Monica.